The capital squad has already played in this Cup, gripping victory in the match against “Tobol”, and for players from Atyrau this was the first game in the tournament. It is worth noting the fact that the team from Atyrau is a team rostered of Kazakhstan players from «Barsy Atyrau» and their AGU teammates, but despite the fact that a team consists of the National League two teams, «Astana» was still the favorite in this game. The capital team justified its title of a leader from the first minutes of the match and immediately seized the initiative has made a breakthrough right at the start. The team from Atyrau tried to impose the struggle on their opponents, but this was clearly not enough, and they lost the first quarter with a gap of 12 points. 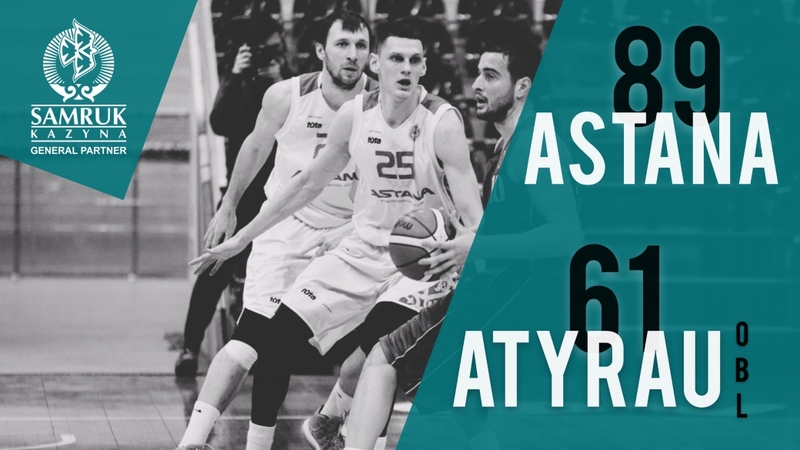 In the second quarter, “Astana” also continued to control the match and increased its advantage to 20 points, and the first half ended with a score of 57:39. The third quarter was completely unsuccessful for both teams, but Astana players continued to hold the initiative. According to the results of three quarters, “Astana” was already leading by 24 points and this spared the game of the intrigue. In the final period, the basketball players from Atyrau region slightly caught up with their opponents at the start, but in the end, “Astana” confidently brought the game of victory — 89:61. The key point: from the very first minutes of the match, “Astana” quite confidently showed its ambitions to win this game and did not leave any chances to the opponents to fight back. Best players: Dmitry Gavrilov (22 points, 4 assists, 3 interceptions) was most effective in the “Astana”. In the team of Atyrau region, Ilyas Zhunusov became the best (16 points, 3 rebounds, 3 assists, 3 steals). Next match: Tomorrow the capital basketball players will have the opportunity to take a breath before the game with «Sinegorye Kokshetau», which will be held on April 5, beginning at 16:30, Nur-Sultan time. Detailed information about the tournament, tournament tables, schedule and results of matches are published in the section Tournaments.